Hey everyone!! Today I will be doing some animal riddles from Just Joking. They will be just random one from random pages. Riddle: My little friends and I love wood. Your houses made of wood are good. Our houses look like towers for giant colonies of ours, like this one! It's the perfect nest- a miniature Mound Everest. Riddle: One of eight (a special herd), who thinks that he's a winter bird without feathers, only hoofs, which he thumps on lots of roofs. A. One of Santa's reindeer! Riddle: What letter must be added to "new" to make an aquatic amphibian, also known as an eft? A. The letter T, Newt!! Riddle: What is the purrfect cat car? Hello! Today I will be doing a review about the series Stick Dog. 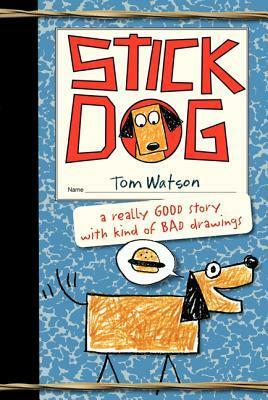 Stick Dog is a really interesting and easy-to-read series. It's basically about these five dogs, Stripes, Poo-Poo, Karen, Mutt, and Stick Dog. They are homeless and stray dogs that are desperate for food, and somewhat badly drawn. In the first book, they smell burgers! And then go on a search for the burgers! That's enough for right now!! I might be trying to post 1 post in the morning, and 1 post in the afternoon! So, 1 before my school, and 1 after my school (and my homework). Do I like bananas? Yes, I do like bananas. Do I like this costume? Not. At. All. Well it's summer and that's birthday time for some of us, so here are some birthday dogs. Because everyone likes dogs? Well, almost everyone. But everyone sure does love birthdays, right? Oh well. Yay, everybody loves left over CUPCAKES! It's our birthday but he gets all the presents. I'm tired from that Easter egg hunt. I don't get to find eggs but the kids do. Oh, was I supposed to share the eggs? Happy Easter says the dogs in their head but, this dog says it for real. Oh, were these for the kids? Our site is clogged up with stupid spammers! We have some blog post submissions but the spammers also loaded our website with thousands of ads and yucky fake posts. We need help cleaning it up! In the meantime here is a messy pig. Here are some dogs that are ready for Halloween! I don't need help. I can swim by myself. I don't want to be a monkey. Why is it so grey in here? Mow. I am not a dog. Do you like the flowers in my background? Do you like my flowers? Do you like the flowers I brought for you? here are some pets in Santa hats.